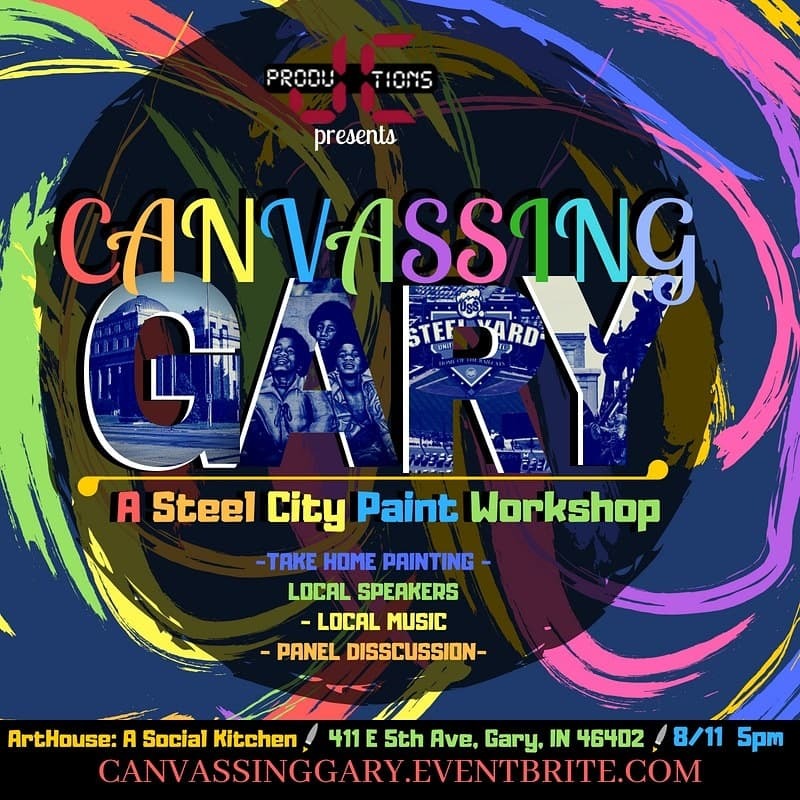 Join us Saturday, August 11th, at 5:00 PM as JC Productions presents a Gary inspired paint and sip workshop which will feature live music, instructive canvas painting, and a panel discussion from influential people in Gary, Indiana. Their goal is to inspire the citizens of Gary by seeing the beauty of Gary through art! The CD Release & Listening Party of A Different Me – Same God by Pharis Evans Jr.
Join us Saturday, June 2nd from 6:00 PM to 8:30 PM at the ArtHouse: A Social Kitchen as PHEV Entertainment presents The CD Release & Listening Party of A Different Me – Same God by Pharis Evans Jr. The night will include a live performance by PEJ followed by a musical Q&A. Visit http://www.pharisevansjr.com/ for more information. ZUMBA FITNESS with Niki Woods! This Latin-inspired dance fitness workout class is a mix of low-intensity and high-intensity moves for an interval style, calorie burning, dance fitness party. It’s a total workout, combining all elements of fitness – cardio, muscle conditioning, balance, flexibility, boosted energy and more! RSVP is strongly encouraged at http://arthousezumba.eventbrite.com. Niki has been a much sought-after ZUMBA instructor in Northwest Indiana and Chicago since 2011. Her energetic spirit for ZUMBA has inspired over 10 women to become licensed instructors, including her daughter. She has helped others build their businesses in various locations across NWI and Chicago areas. Niki’s classes at Salem Baptist Church, Chicago drew more than 100+ women where she warms up and cools down with her “dance like no one’s watching” instructions, self-love and hugs. Niki is a diehard philanthropic, toting a power-packed schedule where she gifts her time, talent and dollars to the causes that are near to her heart. Her passion for health and fitness has sponsored many events which have funded charities at local and national levels. Niki was 1 of 50 women to receive the 2013 Women of Excellence Award presented by the Chicago Defender newspaper. Connect with her at www.nicolewoods.zumba.com or on Instagram @n_woods1220. ArtHouse | WE ARE HERE Patio Festival! You’re Invited! Join us at ArtHouse: A Social Kitchen for the unveiling of our latest art installation, ArtHouse Patio. Thursday, May 3, 2018, starting at 9:30 AM to 7:30 PM. Bring in Spring with the WE ARE HERE ArtHouse Patio Festival, celebrating this new outdoor addition to the NWI and Gary community. Located at 411 E. 5th Ave Gary, IN 46402, ArtHouse patio festival offers a full day of fun for families, kids, seniors, teens and young adults. Schedule of events is packed with performances and activities throughout the entire day and evening. There’s something special for absolutely everyone! These events are FREE and open to the public. Complimentary bites and food for purchase will be available throughout the day by our ArtHouse Culinary Business Incubator (CBI) students, emerging chefs, and culinary experts! RSVP is required for entry to ArtHouse Patio Festival and can be used for admission to any/all events throughout the day. Please Note: A digital or printed ticket must be presented for entry for all attendees. ArtHouse: A Social Kitchen is a unique destination for food, culture, and art in Gary, Indiana. ArtHouse provides access to a commercial training kitchen for local residents and emerging businesses, culinary business incubation (CBI) and operation space, a pop-up café shaped by CBI participants, community dinners in Gary homes and the café, and gallery/exhibition space. ArtHouse is focused on creating a space that positively reflects the City of Gary and provides a platform for economic and artistic activity in the downtown area. The site will evolve continuously through the work of partner organizations and creative individuals. It is a dynamic destination for food, culture, and art lovers to meet, gather and learn. Special free events are hosted weekly at ArtHouse to compliment the business and training activity in the facility. Culinary + Art Exploration events are facilitated by local and regional experts and are free/open to the public. Events are appropriate for novice to expert: growers, food hobbyists, enthusiasts, culinary entrepreneurs, butchers, caterers, bakers, food vendors, chefs, and restaurateurs. No experience is necessary to participate in Culinary + Art Exploration events. Join us! For more information on this event contact ArtHouse: A Social Kitchen staff at arthouse@arthousegary.com or visit www.arthousegary.com. Join us for a night of live entertainment and social gathering at ArtHouse: A Social Kitchen (411 E 5th Ave, Gary, IN 46402), featuring a live music set by songwriter, pianist and vocalist, Kenny Wesley with Guest Host Jamie Steele. Doors Open at 7:30PM | Showtime 8:00PM. This is a 21 and over event! He is a songwriter, pianist, vocalist with a range spanning more than four octaves, and a linguist who speaks five languages. His name is Kenny Wesley. With three acclaimed projects, numerous accolades, collaborations, compilation features, and high-profile performances under his belt, including a win as a finalist (and sole U.S. representative) for the Quincy Jones-curated Montreux Jazz Festival’s Vocal Competition, Kenny has firmly placed his stamp on the burgeoning modern music movement. His songs, fusing elements of electronic, jazz, funk, classical, folk and gospel, have been prominently featured on radio, film and TV – including the FOX series So You Think You Can Dance. A welcomed guest to festivals and legendary venues across the globe such as SXSW, The Kennedy Center, Southport Weekender, Jazz Cafe London, Blues Alley, A-Trane, Jazzclub Birdland, Montreux Jazz Festival, Ronnie Scotts, The White House, National Cherry Blossom Festival, Jazz à Vienne, The Blue Note, Bohemian Caverns, and The Apollo Theatre Cafe, he has shared the stage with numerous artists and musicians including Maysa (Incognito), the B52s, Vinx, Rachelle Ferrell, Kurt Elling, Sheila Jordan, Jean-Paul Bourelly, Giacomo Gates, Vikter Duplaix, Leela James, Charnett Moffett, Frédéric Yonnet (Prince, Stevie Wonder), Mino Cinélu (Miles Davis, Weather Report), Federico Peña (Marcus Miller, Meshell Ndegeocello), Stephanie Mills, Regina Belle, Zo!, Carmen Rodgers, Phonte (Little Brother, The Foreign Exchange), Alice Smith, Eric Roberson, Kindred and The Family Soul, N’Dambi and Syleena Johnson. and Los Angeles, California , which is currently on display here in Gary at ArtHouse. This is a free event and open to the public. RSVP strongly encouraged. Click to RSVP. ArtHouse is also looking for a few local students of the arts to display some of their work. Please contact Eva Collins at 219.979.8156. Game Night is an event where adults and kids, young and old come together to play clean and fun games. From board games to life sized games enjoy time with your community of friends. Bring your family to enjoy in the fun! We have life-sized games like Jenga, Connect 4, Dominoes, and Playing Cards. This event is free, and open to public. Click to RSVP, STRONGLY encouraged! GAME NIGHT (Adults 18+) is an event where adults, young and old come together to play clean and fun games. From board games to life sized games enjoy time with your community of friends. Invite your BFFs and it’s a great date night! Please bring games to share. Snacks provided.